Here are some beautiful pictures taken by my friend Ashley Mefferd. She is an enviromental meteorologist in Denver and is experiencing the big snow storm. The colors of fall mixed with the beauty of winter. I’m sure most of you have heard about the tragic event at the Indiana State Fair the weekend before last, when a concert stage collapsed, crushing dozens of people and killing six. This was not a freak occurrence. In fact, there have been three weather related stage collapses this summer (Cheap Trick in Ottawa, and Chicago band The Smith Wessons in Belgium). This time of year there are many outdoor fairs, festivals, concerts and sporting events. There are three main players in protecting people from weather disasters at large outdoor events – the NWS, the event organizer and the emergency management community. I recently sent an email out to the emergency management community encouraging them to be proactive in working with event organizers in their counties and communities to make sure there is a severe weather plan in place. We have done severe weather preparedness workshops for large event venues in the past, and we will be developing a large event severe weather preparedness guide to post on our web page soon. I will be giving a presentation at the Illinois Emergency Management Agency Conference in Springfield next month on severe weather planning for large venues and schools. We also encourage large event operators to become StormReady. Monitor – have someone monitor radar, and have a NOAA Weather Radio. Have a secondary method to receive warnings in case NOAA Weather Radio fails. Have trained weather spotters at the event if storms threaten. Act – If a watch is in effect or storms are approaching, review the plan and be prepared to act quickly. If a warning is issued, or if severe weather is reported, don’t hesitate – take action! “I was lucky enough to not go through the tornado itself, we were about 8 miles away from the path it took at its nearest. I had been sitting at my computer watching the National Weather Service updates and had my TV on to the local news because they had known the storms would be bad long before they hit, especially as Raleigh had been hit earlier in the day and we live on the coast. It was nerve wracking watching the storms coming, hearing more and more reports of tornadoes and outside it was sunny. The storms started rolling in right around sunset, at first it was just some strong winds and I could see almost constant lightning off to the north. Our county got a tornado warning once, but it was for a tornado on the other side of the county and moving away from us so I didn’t worry about it. My neighbor, who grew up in California, called me a few times to ask if it was time to go into the bathroom and in between her calls I was talking to my mother on the phone as well to keep her updated. I believe it was around 8pm that we got the warning that there was a tornado on base that may be heading either to Piney Green or Hubert. I live in Hubert and a good friend of mine lives in Piney Green. That was when we went into the bathroom and sat, myself and my 3 kids… with a mattress ready to be thrown over us at the first sign that it had come our way. After almost an hour in the bathroom I finally decided it probably wasn’t coming our way so I got up and found out it had actually hit Piney Green, so I started texting my friend to find out if her and her children were okay (both of our husbands are deployed so we try to watch after each other.) A few minutes later she called me, obviously very freaked out, and told me the tornado had just gone through her back yard. Her home was not damaged very much, her family was safe, but her neighbor’s home was pretty much gone. I got on Facebook on some support sites for Marine wives in the area and saw more and more reports of houses on base that had the upstairs completely ripped off, one whose cars were stacked up in their driveway and one who merely lost her firepit, though two doors down there was a huge hole in their roof. Today I went up to Piney Green to help out my friend with cleaning up her back yard so her kids could get out of the house to play. The place has been deemed a disaster area and blocked off, with police guarding all entrances. We had to go to the headquarters they had set up a bit further down the road and get permission to even enter. Driving through here gives you this strong feeling that I really can’t describe. I’ve been through tornadoes before, the one in Mount Morris a few years back happened at a time when I was employed in that town. I’ve seen damage after all sorts of storms back home in northern Illinois, but this was something completely different. There are houses that look totally fine except the tree sticking out of them. Houses that lost a garage and their roof but otherwise seem untouched. Piles of debris where houses used to be. Cars with thick branches through the windshields. Branches wrapped around themselves around electrical wires. Sheet metal wrapped around the tops of trees. The National Weather Service says the storm was an EF3 and the winds got up to 145mph. Once I was at my friend’s house and got to her back yard that was very apparent. She used to live in front of a wooded area with many trees. Out of probably over a dozen trees she used to have, she has maybe two that will still exist when cleanup is finally done. While cleaning up the little bits in her yard, I found pieces of people’s ceilings, pieces of roofs, pieces of shingles that the wind had sliced 3 inches into her fence that were just hanging there, people’s gutters, siding, so much glass, along with branches from various types of trees. The damage to her home really was minimal compared to others with the corner of her roof lifted up. If the tornado had come any closer she would have lost her roof. Her entire shed (a large wooden one not one of those small metal ones) was lifted and set down two feet from where it used to sit, landing on a small basketball hoop and leaving her brand new riding lawnmower which was sitting next to it completely untouched. There were people hurt in our area, including an 18 month old who was in critical condition. 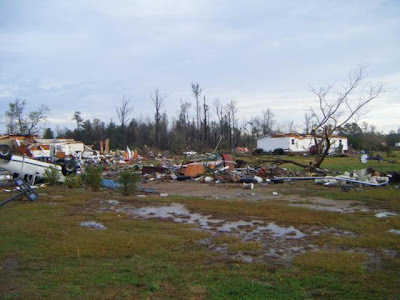 We were so blessed that there were no fatalities here, especially with the destruction that happened. Many other tornadoes from the same storm system did cause fatalities, 22 total in North Carolina alone. The base (that houses many people’s homes which are now completely uninhabitable) had a meeting last night where they announced that they will house the displaced families elsewhere until new units are available for them to live in. I’m really not sure what people out in town are going to do. Hopefully they all have insurance to cover everything. Of course, some things even insurance cannot cover. I read a story of a lady who lost the home she had lived in since the 1970s! Being so close to a Marine Corps base there is always a pretty strong feeling of community when disaster strikes. Many families who were not impacted are donating to those who were…whether its clothes, food, shelter or help cleaning up. I have heard and seen pictures of Marines being let off of work on base to assist families in retrieving items from their homes. I honestly have no clue when things will get back to “normal.” At least two schools in this area alone will be cancelled for the rest of the year. There is a barber shop on the main road off base housing that sustained damage, their front door has a plank over it spray painted with “still open, use back entrance” One big thing I noticed was the power was back on to all customers only a day after it happened. That was pretty amazing to me!